Believed to be founded in the year 1577, Amritsar holds a huge significance for Sikhs around the world. Being the homeland of the famous Golden Temple (also known as Harmandir Sahib), it is visited by a number of Sikh devotees every year. So, if you are planning pay a visit to this divine temple and wondering how to go? Then, take up this 2 nights and 3 days tour package that includes visit to the famous temple and other attractions of the city like, Jallianwala Bagh, the Durgiana Temple etc. Book it now! Located at a distance of 9 KM from Amritsar Airport and 2 KM from the bus stand, this 2 star hotel is a supreme tourist and business hotel in the city. The hotel offers comfy stay in its wide range of tastefully done guest rooms. It has a multi-cuisine restaurant that serves a range of lip smacking dishes. On arrival at Amritsar Airport / Railway Station, meet our representative who will transfer you to the pre-booked hotel. Check-in at the hotel and freshen up to leave for an evening visit to the Wagha Border (International border between India & Pakistan). Also, enjoy the show there. Overnight stay will be at the hotel. After taking breakfast, proceed for a visit to the Sikh holy shrine of Golden Temple (also known as Harmandir Sahib). 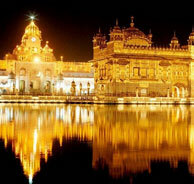 Later, proceed further with the sightseeing tour that will include visit to other attractions of Amritsar like, Jallian Wala Bagh, Martyr's Gallery Museum, Durgaina Temple etc. Return to the hotel for the overnight stay. Enjoy leisurely breakfast and get transferred to the Amritsar Airport / Railway station to continue the journey back home.